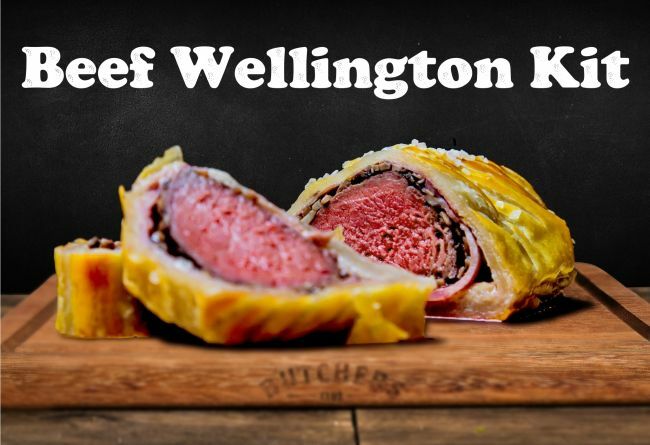 The beef wellington kit includes everything you need to produce your own Beef Wellington Dinner for 2 at home. Including 400 grams of the finest Black Angus tenderloin steak. 3. Season well with course sea salt and black pepper. 4. Add vegetable oil to a thick bottomed frying pan and heat until smoking. Make sure you have good ventilation or your kitchen will fill up with smoke! 8. Baste the beef with the butter using a spoon, continue to baste for around 3 minutes. Be careful not to burn the butter! 10. Assembling the Wellington is the most critical part. Take a sheet of cling wrap and order the prosciutto on top. They should slightly overlap each other. 11. Spread nice and thinly the mushroom mixture on top, half an inch from the ends. 12. Put the meat on top and very carefully fold it over. Push and roll it all the way over, so that the prosciutto covers all of the meat and mushrooms. 13. Nip at the ends and squeeze to“ form something like a big candy. That's how you will seal the shape. The tighter, the more perfect. 14. Place in the fridge for 15 minutes to firm up. 15. The final wrap is puff-pastry. 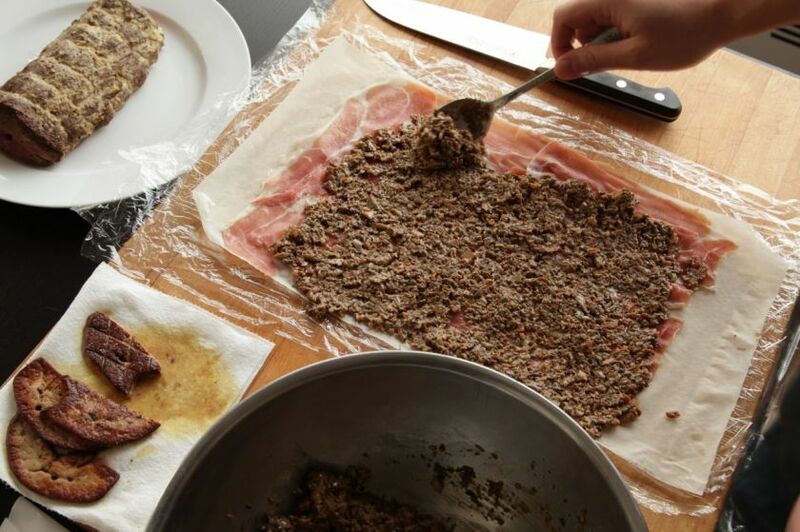 Take out the roll of beef, ham and mushroom and put it in the middle of a puff-pastry sheet. 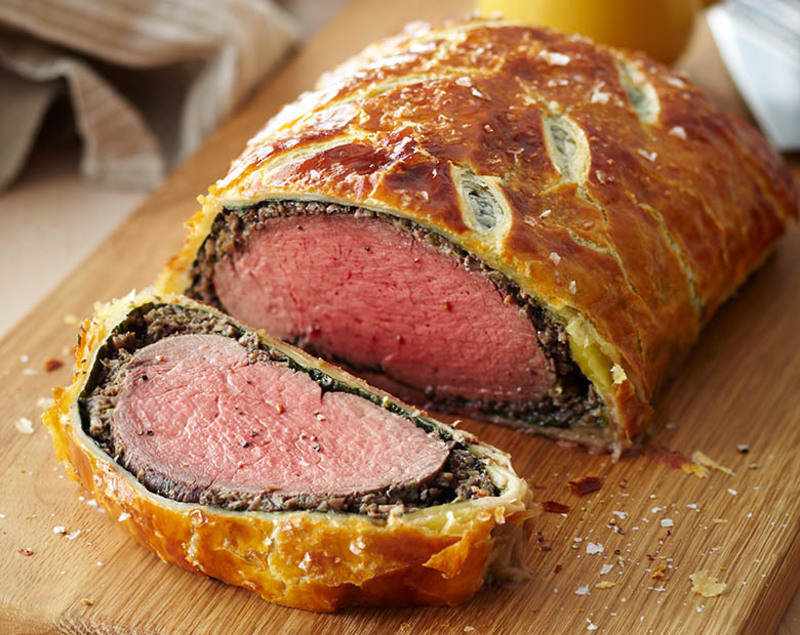 Roll, until the two edges meet, cut off the extra pastry and twist the ends together to seal completely the beef. Put it back in the fridge for 5 minutes to firm. 16. Remove from the fridge it at room temperature for 20 minutes, to ensure even cooking. 18. Bake in the oven at 200 degrees for around 20 minutes for medium rare or 25 minutes for medium. 19. Once out of the oven ensure that you leave it to rest for at least 10 minutes for the meat to relax and reabsorb its juices. 22. Serve with a simple green side or roasted vegetables.